It can be a simple over-flowing sink onto the kitchen floors, or perhaps a toilet didn’t flush properly and it sloshed out onto your bathroom floor. Then again it can be a little more serious, as a broken pipe in your ceiling. 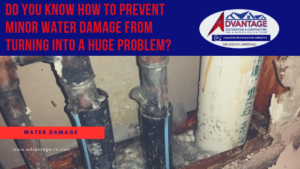 Water Damage is caused when a problem goes without being noticed right away. Water can ruin your carpets, furniture, ceilings, walls, and it can also destroy your family’s possessions, documents, and irreplaceable personal items. No matter what a Water Damage in your home is bad news. Even the tiniest bit of water damage can cause all kinds of problems, from the worse mold damage to the least pesky odors, and even Some water damage situations you may need to vacate your home during the Water damage repairs. During this process, it can cause havoc and it alters your daily routines. There are 3 things you can do to help prevent Water Damage in your home. You NEED to Know where the water supply turn-off location is. If a pipe breaks and spews water all over, knowing how to turn off the water is important. You have pipes and water supply points all over your home. The one main turn-off location should be on everyone’s mind. What may be dripping slowly can quickly become a bigger problem soon. And don’t forget those hoses under the sink that feed the dripping faucet. They can burst, too. Look for wet areas under all sinks. Change the hoses on your washing machine. Washing machine hoses are pretty cheap to replace but if one of them were to burst, it’s disaster time. These hoses are always under pressure and if they, for some reason, tend to break when you are not at home. We recommend the steel braided hoses you can purchase them at your local Lowes or Home Depot. There are other ways water damage situations can occur in your home, these are your common water damage problems. Don’t make a mistake. Prepare now and avoid problems in the future. When the worst things happen, such as a water damage in your home, don’t delay! “In the time of disaster, we react faster!” Advantage Restoration & Contracting provides 24/7 Disaster Restoration Services! (813) 757-0717.